Our Moving Makeover offers easy and practical tips, how-to's, ideas, and encouragement to make a change and improve your life in your home, your health, fashion, or beauty. WRAP the egg in either a paper towel or paper napkin. You want to be sure to wrap the egg as smoothly as possible, without creating too many folds. SECURE the paper napkin by wrapping a rubber band tightly at the top. FILL a spray bottle with 2/3 water and 1/3 vinegar and SPRAY the entire surface of the egg to make it damp. 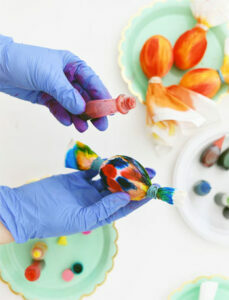 After putting on your protective gloves (trust us, you don’t want your hands to get dyed), use the food coloring to directly BLOT small drops of color onto the egg. Keep in mind, the color will spread as it touches the wet surface, so less is best. You can always go back to add more! 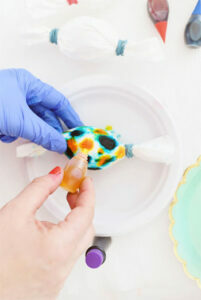 After letting the dye soak into your eggs, be sure to give them a little squeeze (so the dye soaks into the shell) and let them SET on a covered surface. WAIT for about 30 minutes before unwrapping the eggs. The paper towels and napkins will have the most amazing designs… almost as good as the eggs themselves! 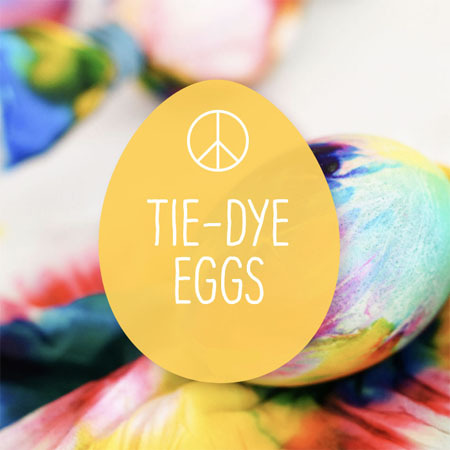 When designing your eggs, remember that both white and brown eggs work for this method of dyeing. If you want more of a vibrant outcome, use a white egg. 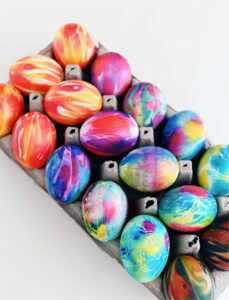 Brown eggs look very cool tie-dyed as well, they simply have a darker tone. 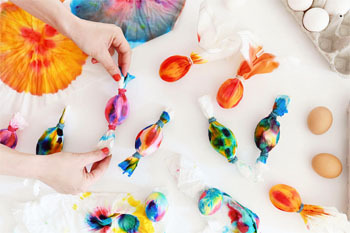 If you plan to eat your decorated eggs, make sure to use only food-safe decorating materials. For more on Easter & Egg Safety.